Although India continues to proceed with great promise, the poverty line has yet to bridge the enormous gulf between the rich and the poor. The maximum number of people in our country does not have the basic amenities of life which includes a roof over their heads and a safe shelter at night. The number of street dwellers is growing at an alarming rate and this is something which bodes serious concern indeed. The Scheme promises to provide housing provisions for the homeless by the year 2022. This is the time by when our country would be proudly celebrating 75th year of Independence. 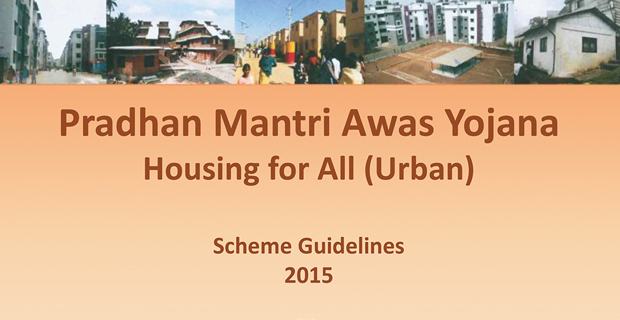 Government is welcoming the online applications for Pradhan Mantri Awas Yojana. The qualified applicant can apply online for the Pradhan Mantri Awas Yojana by just filling their contact particulars as well as the AADHAR Card number. Online form can be downloaded from the website which is free of cost. One can found the application form from the website under the link Citizen Application. One can check the status of their application online by filling the AADHAR Card number and application number. One can apply for Pradhan Mantri Awas Yojana through Common Service Centers. The cost of online submission of Pradhan Mantri Awas Yojana application form through Common Service Centers would be Rs. 25. These centers have to give acknowledgement receipt of the online application of Pradhan Mantri Awas Yojana in print form. This means that by making the whole procedure online, it can be carried forward with much quick speed. So be hurry and fill the online form. This program launch has proved very effective for the street dwellers. If the private developers provide excess plots of lands, those can well serve as rehabilitation houses for the under privileged and homeless. The Public and Private sectors can collaborate to provide Affordable Housing for the weaker section which would be within their economic budget. The more underdeveloped section of the society can also opt for credit linked subsidy to get the Promotion of Affordable Housing society. Individual house and house constructions should also be provided with subsidy for beneficiary. A slum may be defined as a somewhat congested plot of land which houses a good number of families. The conditions of living are far below standards than expected normal in this kind of housing colony with improper sanitary conditions and low quality drinking water. This PMAYU movement would strive to make things a whole lot better by providing the urban street dwellers a safe and healthy shelter. The EWS or the economically weaker section of the society and people from the LIG or the low income group comprise the major beneficiaries of this scheme. For the people from the EWS group the annual income is considered to be 3 lakhs. But for the people from the low income group it is considered to be three to four lakhs. The beneficiary family can comprise man and wife and unmarried young people. However there are barring factors which state that a family which avails this government policy should not be in the ownership of a pucca house. The pucca house should not be owned by any member of the family in any part of the country in order for them to gain advantage of this mission. A house is the basic need for a human being to return to at the end of tiring day. Once you know that you have a safe and comfortable place to go back to where your loved ones await your return, you feel much comforted. So this is why the Prime Minister has launched this movement so that all the Indian citizens can obtain a house within their financial capacity and realize their dreams. Previously this scheme was also known as the Housing for All Scheme. It was introduced on June 2015 and targets at constructing two crore houses which would provide shelter to the currently homeless throughout the length and breadth of the country. By the year 2022, this target is expected to be fulfilled. Other than economically weaker section or low income group individuals, other people who can seek assistance from this scheme are the individuals of scheduled castes and tribes. The best part of this scheme is that it accommodates Indian women also of all religions and castes. So it can be safely said that once this movement is launched no woman will ever be homeless again. All individuals are equally eligible to approach this movement and thus there is no bias or discrimination against anyone on any prejudices. The people from the LIG ,EWS and MIG would be eligible enough to get a subsidy grant from the government which range is from one lakh to 2.30 lakhs. This money is provided from the central government treasury and will permit the people to build a house under the scheme within comfortable finances. The ladies will definitely get first preferences when they approach this scheme. This puts the scheme in a much favorable light when it comes to getting shelter for women. Also when it comes to ground floors of the houses, provisions will definitely be made in first preferences for the senior citizens and ones with limited mobility. Recently the Ministry of Housing and Urban Development has approved a new PMAYU proposal. New affordable houses will be constructed. According to PMAY we know that in the urban areas the poor will shift to new housing locations. These houses will be cheaper and banks would give loans to the poor at cheaper interest rates. The beneficiaries of these loans can repay these loans in a subsidized rate of 6%. At present the total investment of the government for building these houses is Rs. 1 lakh crore. It is estimated that by the end of the year 2019 many urban poor will have a roof over their head. This will help give shelter to several of those who have kuchha houses. The project is taken up in six states and it will be implemented by the assistance of the local state government. Nearly 1, 17,814 houses are sanctioned and they will cost Rs. 5773 crore to build. The central assistance for the same will be Rs. 1,816. This amount is approved by the Prime Minister Awas Yojana for the urban areas. The rest of the money is granted as a loan to the home owners. The ministry has specifically asked that the process speeds up. The houses must complete within the original time frame of 2022. Within this time, the Awas Yojana first phase house building shall be completed. State government is providing the land to the urban poor and the BLC is enabling them to build their houses. The houses will get all basic amenities and they will also have balconies, attached bathrooms and modern facilities. Till now it is Tamil Nadu which has built the highest number of houses – 2, 27,700. Madhya Pradesh comes a close second with 2, 09,036 houses built. Now even 27, 475 new houses are going to be built in Madhya Pradesh. Karnataka will get 31,424 new houses. Its 234 cities and towns are considered eligible for this scheme. Rs. 1,222 crore is assigned for this scheme. Rs. 518 crore is the central assistance to the state. States like Jharkhand, Bihar and Orissa will get 20,099, 25,221 and 2,115 houses built for this fiscal year. All of these houses are getting immediately started on. The beneficiaries will keep receiving the government grants for the same. I have applied for Credit Linked Subsidy Scheme 2016. Nobody contact my message for this scheme. please check this scheme. How to apply? and what is last date for submit application form? I am repeatedly trying online to get Citizen Assessment to be done, but unable to achieve any success as after entering Aadhar number I get a msg saying it’s checking but in few seconds it goes back to same page. What are the conditions for PMAY and how i can apply the application form for this? After form filling where i can sent this form?